A couple weeks ago Oleg Tinkov gave an interview to Bloomberg news. Oleg was his usual talkative self, addressing a number of topics, but primarily focused on the effect sanctions were having on the Russian economy. He made it clear that the current crisis could effect Tinkoff-Saxo. It is interesting that Tinkov chooses to focus on the sanctions as the cause for Russia’s troubles. Certainly they have had some effect but they are far from the primary cause. The multiple rounds of sanctions have been in place for over 6 months and have dented Russia’s economy but the current Russian currency and banking crisis is driven by the rapid drop in the price of oil. Lack of diversity in Russia’s economy has been a concern of economists for years. Oil and Gas account for close to 20% of GDP and over 50% of the Federal budget. Mining accounts for 11% of GDP. As commodity prices climbed many producing countries have become dependent on this flood of cash. 8 years ago Russia only needed oil to be at $21.40 a barrel to balance their budget. By 2015 Russia’s breakeven number had grown to $107 per barrel. Today oil is trading at $49 a barrel. With such a huge deficit it is easy to understand why it is oil, not sanctions, that are at the root of the current crisis. In his interview with Bloomberg Tinkov also went after Germany, the primary driver of EU sanctions. This was followed by rather rambling attempt to diminish Germany while positioning Russia as an equal of China and the US. An interesting position given Germany’s GDP in 2015 will be double Russia’s and Merkel has been the de facto leader of the EU for several years. The crisis in Russia has hit credit card companies, like Tinkoff, especially hard. One of the first casualties was Trust Bank….home of the Bruce Willis Credit card. Tinkoff Credit Systems stock has been hammered in recent months. One year ago it traded at $15.49 a share, today it was down to $2.70. This has resulted in Tinkov seeing a significant portion of his paper wealth erased, but he is far from poor. His 51% holdings in TCS are still worth $250,000,000. It is important to note that Tinkov is not an Oligarch, he is a self made man. When economists talk about Russia’s need to diversify their economy it is entrepreneurs like Tinkov they point to as role models. Beer, advertising, banking, electronics, frozen food, his reach is broad. Tinkov is in the business of starting, building, and selling companies…..a formula that benefits from sponsoring a cycling team. While sponsoring the Tinkoff-Saxo Cycling team may help sell credit cards in Russia there is the added benefit of promoting Tinkov, and his personal brand, in the West. This exposure helped Tinkoff Credit Systems have a successful IPO and it helps when it comes time to sell one of his many holdings to a multinational, as he has done several times in the last decade. Vnesheconombank–Received a $505 million infusion of cash from the government. One of the more interesting sponsors of the Russian Federation, and on the board of Katusha, is Sergey Chemezov. 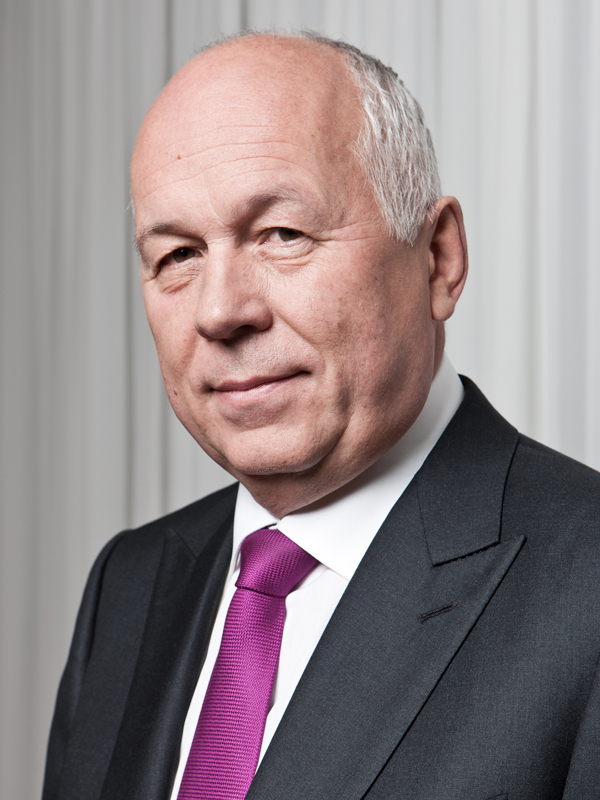 CEO of Rostec, Chairman of the Supervisory Board of the Russian Cycling Federation, friend of Putin…….and target of EU sanctions. EU assets frozen and banned from travel with the Union. In a recent interview Igor Makarov, President of the Russia Fed and owner of Katusha, detailed the significant amounts his oil and gas company puts into cycling. Russia is not the only cycling supporting country with exposure to the drop in the price of oil. Kazakhstan, home of Astana, also derives a large percentage of their GDP (25%) from oil however at $67 per barrel Kazakhstan’s breakeven price is much lower then Russia’s. Recently Kazakhstan’s President assured the public they were prepared for oil to go as low as $40 a barrel. While public assurances are nice it is hard to ignore the fiasco that is Kazakhstan’s largest oil field. They are the key source of funding for the Astana team, but who are they? Samruk is Kazakhstan’s sovereign wealth fund, the recipient of the Oil and Gas revenues that make of a large potion of the countries GDP. Samruk owns most of the important companies in the Kazakhstan, including the national rail and postal service, the state oil and gas company KazMunayGas, the state uranium company Kazatomprom, Air Astana, and numerous financial groups. Cycling has a long history of teams collapsing due to sponsor financial trouble. Mercury-Viatel, Le-Groupment, McCartney. Will we see similar collapses again this year? Likely not….but the days of spending $60,000,000 a year for a hobby are over. Some Russian Billionaires are already exiting their sports related holdings. Today it was announced that Mikhail Prokhorov is exploring the sale of Brooklyn Nets and Russia’s National Hockey league is in serious trouble. Hopefully not a sign of things to coming in cycling. Poll: What team will Nibali be riding for in July?